VPN99 selected its title to suit its excitingly low price of just $0.99 per month, although the price is by far not the only excellent feature of this VPN service provider. VPN99 offers a reliable, high-quality VPN service and branded themselves as a team of superheroes that is dedicated and strong. Their aim is to offer individuals across the globe the chance to escape slow connection speeds, boring VPN services and complex instructions. So here is what the superheroes based in Seychelles can do for you. First, of all, anyone that is not using VPN99 currently is for sure overpaying according to the founder of the VPN services. He himself been an entrepreneur for more than 15 years was first involved with several programs including peer-to-peer service hosting. ServerClub launched VPN99, a unique VPN idea that caters for individuals who need to use geographically locked websites, companies who wish to investigate their competitor’s websites from other countries and anyone who want to use public wi-fi while knowing they are secured. When asked about the price and how such a low cost is maintained, the answer was that when facing the decision between a better-designed user interface or a cheaper product the decision was easy, VPN99 is created to offer everyone in the world the security and freedom that they should have. While the price is amazing, a VPN service is about more than just affordability, even when it does play a major role, and with VPN99 based in the Seychelles that is known for its security-friendly policies and business-friendly environment, VPN99, unlike many other services, can honour their promise of no logs and complete privacy to all users. VPN99 is not P2P friendly and actually don’t allow P2P traffic at all, after being in the online hosting environment for more than seven years the team feels that copyright damages are one of the headaches they want to be without. Hosting by VPN99 is offered via 1,000 servers, while users are not tracked at all while using the VPN services. VPN99 do not know the IP addresses from which users log in once they registered and can’t provide law enforcement agencies with any information, which also prevents agencies from adding sniffers to VPN99’s routers. What makes this VPN service provider stand out from the rest is their honesty, great teamwork, incredibly reasonable price, exceptional assistance and the fact that all systems are constantly updated to prevent any vulnerability and provide the best possible security. VPN99 offers trustworthy VPN services across all platforms including iOS, Android, Google Chrome, Windows, Ubuntu Linus, MacOS, Firefox, Microtik and Windows Mobile. The virtual private network’s main purpose is to secure user’s privacy and security by encrypting all traffic transmitted over the network. 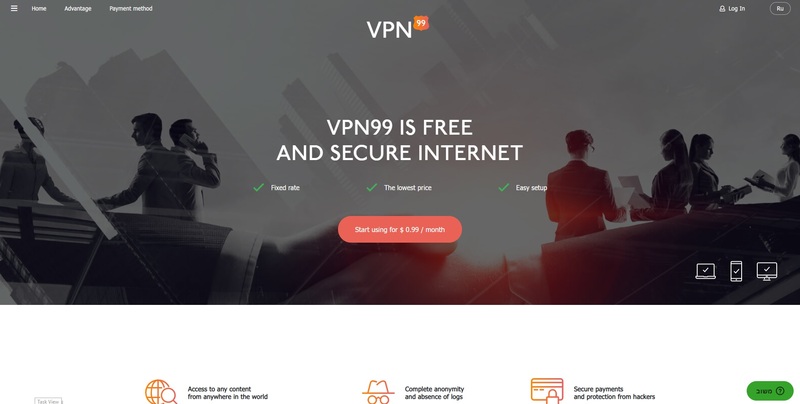 VPN99 adds a new interface to user’s systems in a way that makes it appear to be connected to the private network directly, this changes the users IP address, while hiding their original and encrypts all traffic. VPN99 do not offer a free trial period, although they provide new users with a 24-hour money-back guarantee. It is also important to know that the VPN service provider blocks all torrent traffic and is TOR friendly. By subscribing to VPN99, users gain access to a variety of impressive tunnelling protocols including PPTP, IPsec, L2TP and OpenVPN and what impresses most is the different encryption levels, AES-256-bit encryption by default is used for the OpenVPN protocol, which is the most secure and provide true protection and anonymity to online users, while the PPTP protocol applies 128-bit encryption. The VPN99 virtual private network focusses on providing security, anonymity and full access to the internet. When it comes to security, the VPN-connection ensures all users actions are untraceable by ISPs, government and other security services. All business and negotiations are encrypted and invisible to third parties. VPN99 keeps all user activates anonymous since without direct access to the computer from the global network, it becomes invisible to any service on the internet and users don’t have to worry about hackers or identity thieves. Full access to the internet should be available to everyone, and with the VPN99 connection individuals have full access to any online site, can what movies on any site and listen to music available in any country. VPN99 is the answer for individuals who wish to bypass censorship, evaded hackers, unblock online TV, and make online payments in a secure environment. No matter which time-frame option a user selected they have full access to all protocols and can connect to the VPN service from up to two devices. OpenVPN, L2TP, PPTP and IPSec are all protocols supported by VPN99, which also feature a variety of encryption options, from Blowfish 128-bit to AES 256-bit. The most recommended protocol is OpenVPN, considered as the strongest and the most secure. Based in the privacy-friendly Seychelles, the company does not keep or collect any connection or Internet activity data. Once connected the OpenVPN icon turns green and it is time to enjoy complete freedom and anonymity. VPN99 is rated best for gaming, Pandora, sports and hiding IP addresses, while it supports Hulu, HBO, Kodi and Roku. While it scores top points for its robust encryptions and incredible price in speed and performance it is average and got an average score of 7.2. What massively counts in VPN99’s favour is its extremely affordable payment options and its robust encryption. Support is available around the clock and installation takes around 14 minutes, while the website offers download and installation tutorials for MacOS, iOS, Android, Google Chrome, Windows, Ubuntu Linus, Firefox, Microtik and Windows Mobile. For only $0.99 per month, users can enjoy VPN security on up to two devices, unlock all websites and feel more secure when they need to use public wi-fi. What potential clients need to remember is that VPN99 do not support P2P or Torrenting although one thing is for sure and that is that no records are kept of any user’s activities since the VPN supplier is based in security-friendly Seychelles. VPN99 offers the security internet users desire since cyber predators and hackers will not be able to interfere with any online connections since your real IP address are invisible. No one can trace sites visited or what files are downloaded via the guaranteed anonymity, and with full access via the VPN connection VPN99 users can visit any site, enjoy movies and enjoy the freedom the way it is supposed to be, all at an affordable monthly rate.